When Bay Area Bike Share announced the system's tenfold expansion nearly a year ago, some bike advocates and city officials in San Mateo and Santa Clara counties were disappointed to hear Peninsula cities wouldn't be included unless they covered the costs. But now the city of San Mateo is launching its own bike share pilot that transportation officials say might serve as a better model for suburban communities. The San Mateo system, called Bay Bikes, launched on Bike to Work Day Thursday with 50 bicycles at 11 stations. Though small, what makes this bike share system different is that the bikes are locked on bike racks. There are no docking stations. "We think it's an amazing model for a city like San Mateo," said Kathy Kleinbaum, San Mateo's interim economic development manager, who is overseeing the program. Riders can find and reserve a bike using a mobile app through New York-based Social Bicycles, which designed and manufactured the bikes. Designated bike racks, or stations, have been placed around transit hubs, large employers and commercial districts. You can actually lock the bike to any bike rack, but there is a $3 fee if it's not parked at or near a bike station. "I love these bikes, because I have the option of locking them anywhere in the city instead of bringing it back to a station. It really gives the flexibility to ride where I want when I want," Ken Chin, San Mateo's former transportation planner, said in a press release. Shiloh Ballard, executive director of the Silicon Valley Bicycle Coalition, said this type of system may also cost less, and involves a less cumbersome permitting process. "We're really excited," said Ballard. "Between these different systems, you may have different models that work better for a more urbanized area, versus a more suburban community." Eventually, Kleinbaum says, it might be possible to integrate Bay Area Bike Share and Bay Bikes, and allow users to access both systems with a future version of the Clipper Card, which is used to pay transit fares electronically in the Bay Area. For now, people have to sign up separately. 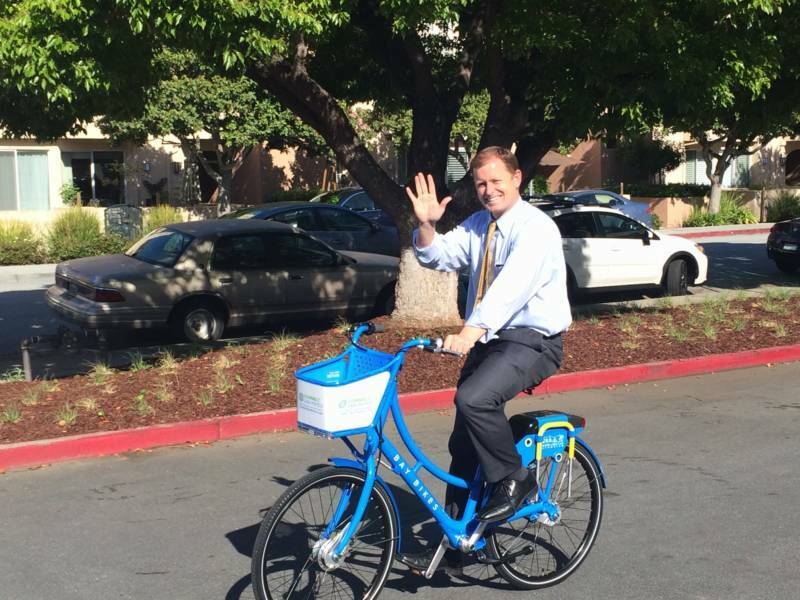 Transportation officials cited low ridership last year for not wanting to include Bay Area Bike Share's expansion to Palo Alto, Redwood City and Mountain View, which are pilot cities. But Ballard said the key to making bike share work is the number of bikes and the density of docking stations, and "one can, I think, make the argument that we didn't put enough bikes there and we didn't put enough pods there." Ballard said the number of people biking is increasing in Santa Clara and San Mateo counties, due in part to better bike infrastructure. For Bike to Work Day, Ballard said the organization counted an 18 percent increase in bike commuters compared to last year, from 30,000 to 35,000. The three Peninsula cities where Bay Area Bike Share was piloted have to decide soon whether to continue with the system, which will get a different name and branding to reflect its corporate sponsor when it expands to 7,000 bikes at 700 stations. The Metropolitan Transportation Commission recently announced that $4.5 million in grants will be available to help cities fund bike share outside of the program's expansion area, but the money does not cover operations, according to Palo Alto city officials. Kleinbaum says those cities will be following San Mateo's pilot closely. Similar bike share programs using Social Bicycles operate in Santa Monica, Long Beach and several cities in the U.S. and across the globe. The San Mateo system is being run by a San Francisco-based company called Bikes Make Life Better. The system, which cost the city $350,000, will run as a pilot program for three years. But Kleinbaum says if it proves popular, it could be expanded sooner. "We've had a lot of interested people," said Kleinbaum. "We're just keeping our fingers crossed and hope that it goes smoothly."